Heralding the arrival of Ex-Driver's Global Trance Russia album - released 31st March 2014. 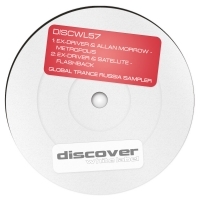 Discover White Label proudly presents this two track sampler with both works involving the man-at-the-helm together with collaborators Allan Morrow and Satellite. Both 'Metropolis' and 'Flashback' are indicative of the cool, melodic vibes and stylish production that typify the album. 'Metropolis / Flashback' is available now from Beatport and iTunes.